Star Fluxx mixes in lots of sci-fi references. Overview: Fluxx , the wacky card game of ever-changing rules, is back with a sci-fi theme. Star Fluxx has it all: Star Wars , Star Trek , Dr. Who , and a lot more, all thrown into a blender and turned into a very silly game. Rating: While it’s not the answer to life, the universe, and everything, Star Fluxx is still a pretty funny game. Who Will Like It? Players who like a bit of chaos and don’t mind a lot of randomness in their games. If you like Fluxx and science fiction, then you’ll appreciate the various references thrown into the game. Lots of science fiction. Aside from the shows already mentioned, there’s the monolith from the Space Odyssey series, references to Lost in Space , and a whole lot of generic science fiction tropes like aliens, star ships, ray guns, and so forth. A lot of the references are in the goals: “Small Moon” + “Space Station” = “That’s No Moon…” Or how about “Intergalactic Travel Guide” + “Robot” = “I’m Depressed”? The game comes with 100 cards: Rules, Actions, Keepers, Creepers, and Goals. The illustrations are in full color and are nicely done, and each card explains what it does. 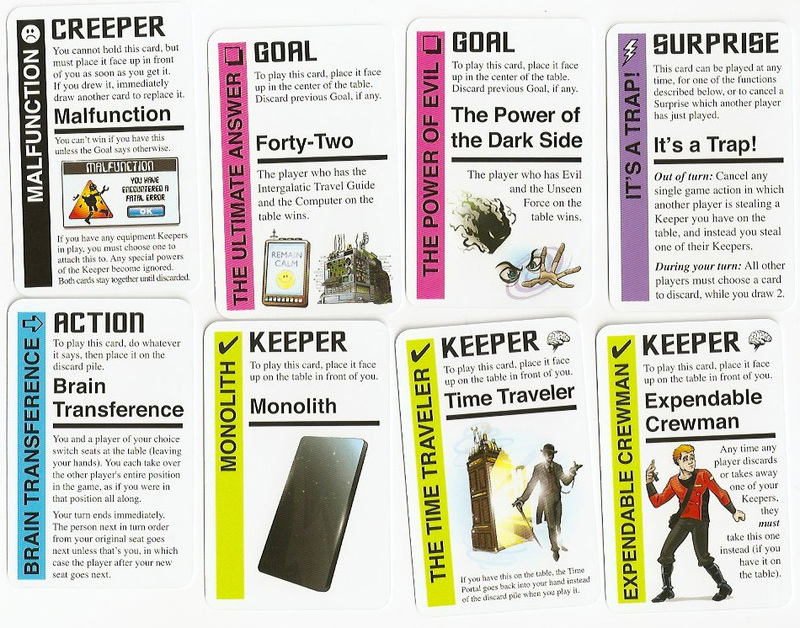 Like some of the later versions of Fluxx , a lot of the Keepers have special effects in addition to serving as objectives toward a goal. The cards are just about standard sized, but can feel a little flimsy and tend to be a little curled, but they shuffle fine. In case you haven’t played Fluxx before, the basic rules are the same across all of the variations, so it’s mostly just the theme and the details that are different. Each player starts with 3 cards, and the Basic Rules card (Draw 1, Play 1) is played in the center of the table. On each turn, you follow whatever rules are in play. At the beginning, that means the first player will draw one card, and then play one card from their hand. Keepers are played on the table in front of you, and will be needed for goals (along with whatever special effects they have printed on them). Creepers must be played in front of you as soon as you draw them, and do not count as a card play. You simply place them down and then draw to replace them. Creepers typically prevent you from winning, unless there is some card in play that says otherwise. Actions (with blue borders) are played to the discard pile, and then you just follow the instructions: steal somebody’s Keeper, draw extra cards, and so on. There are two other types of cards which are a little more complex: New Rules and Goals. New Rules (yellow-bordered) are played to the center of the table, and take effect immediately. Some rules change the number of cards you draw or play each turn, or limit the number of cards you may have in your hand or Keepers in front of you. 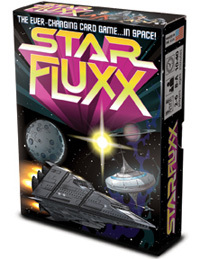 Star Fluxx , unlike some of the other variants, doesn’t have as many themed Rules other than one called “Wormhole” which allows you to draw one card and immediately play it during your turn. (Some of the other variants have things like quoting lines from Monty Python or speaking with a silly accent to get bonus actions during your turn.) Some rules supersede other rules, which are then discarded, but otherwise the rules just accumulate and all of them are in effect until removed by actions. Goals are played to the center of the table, and typically only one goal can be on the table at a time. The Goal is typically a combination of two Keepers, though there are others as well. If at any time you meet the requirements of the current Goal, you win! The Fluxx series has been around for a while, and is one that I found early on in my gaming obsession and still play from time to time. Not everyone likes it — the changing rules and circumstances can make it extremely difficult to plan a long-term strategy — but it’s pretty fun for a quick, silly game. The various themed decks (Martians, zombies, pirates, Monty Python, etc.) can make the game more fun if all the players can catch the references, but otherwise they’re fairly similar in gameplay. I did find, though, that combining decks doesn’t work quite as well as, say, mixing up Munchkin sets, because many of the Keepers and Goals don’t actually interact with other sets. The later sets do have broader effects: things that will affect “things with brains” or Keepers that are people, rather than naming cards that are specific to one set. However, I think most of the time you’ll have the best experience just playing with one themed deck, and maybe mixing in just some rules and actions from the original set. One note I’ve found is that people who have played Fluxx have been able to easily jump into deck-building games like Dominion . The idea of having cards that affect how many cards you draw, play, and discard is prevalent in Fluxx , and so it can help you understand how cards in a deck-builder can affect your available actions. Fluxx isn’t as deep as a deck-builder, but there’s virtually no set up time and it can play very quickly. Plus, it’s funny. You can learn all about Star Fluxx (and the other flavors) at the Looney Labs website. You can buy the game from Looney Labs, Amazon, or your local games retailer. Wired: More sci-fi references than you can shake a Tribble at. Fun illustrations and clever goals. Tired: Cards a little flimsy. Not mechanically much different from other Fluxx versions.